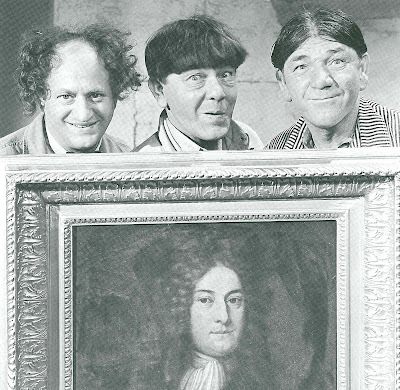 Ann says my gravitating toward The Three Stooges might imperil our relationship. Are all women so hostile to them? I couldn’t be bothered with the team growing up. Maybe that’s for cutting teeth on their dreadful late-term Columbia features at the Liberty where my only solace was a jumbo Baby Ruth and whatever diversion the trailers provided. Lately I’ve come to enjoy them a lot more. You might almost call it a twilight of life discovery (though hopefully I’m a little early for that). Stooge comedies are in a way best when they’re baddest. I’m all for reversing standards when it comes to these boys. Bring on the stock footage, threadbare sets, and Curly in decline. By these criteria, Volume 8 of Sony's DVD series should be most rewarding of all. The last group out (Vol.7) included long awaited Spooks and Pardon My Backfire, both shot in 3D and here available with glasses for home viewing. My own experience with depth screens has always been problematic. Theatres around here invariably bungled the process. Usually it was too dark projection to blame. 3D needs a lot of light. My exposure to House Of Wax was limited to single-strip reissues indifferently presented. You couldn’t help coming away from these wondering what all the 50’s fuss had been about. We agonized through Andy Warhol’s Frankenstein at Greensboro’s Janus Theatre in 1972, from which I emerged with a headache worse than ones Cody Jarrett got. Showing 3D right required considerable expertise in the booth. Sloppy exhibition was no small reason it flashed in the pan. Nowadays 3D is back and thanks to digital projection, more popular than ever. There are still kinks insofar as watching on our own TV’s owing to technical blocks I won’t pretend to understand. You’d risk migraines watching Spooks were it longer than sixteen minutes. Everything’s thrown at the camera but chairs we’re sitting in. I like 3D best when it’s purely exploitative. Spooks is that in spades. Were the presentation better, this would be the fun DVD to beat for 2009. Most first-run theatres in 1953 got Spooks with Fort Ti, a western starring George Montgomery . Columbia offered them as a full service 3D program for summer audiences. You needed left and right prints of every reel and these had to play in perfect synchronization. If one broke, the whole show fell into disarray. Union chapters struck to force two-man booths for projection, as a lone operator might go mad trying to coordinate it all. New York’s Criterion Theatre premiered the Fort Ti / Spooks combination and Showman’s Trade Review sent a man to check out their newly installed 24 by 42 foot screen. Fort Ti had been shot in standard 1.33 to 1 ratio, but the Criterion blew it up to 1.85 wide, a not uncommon practice among theatres eager to jumpstart a panoramic revolution. The Technicolor at times seems pallid, said STR’s observer. There was a break in the morning period and a period in an afternoon showing when the "right eye’ 3D went blind, thought to be due to an arc’s blowing. Even Broadway palaces weren’t immune to third dimentia episodes, it seemed. 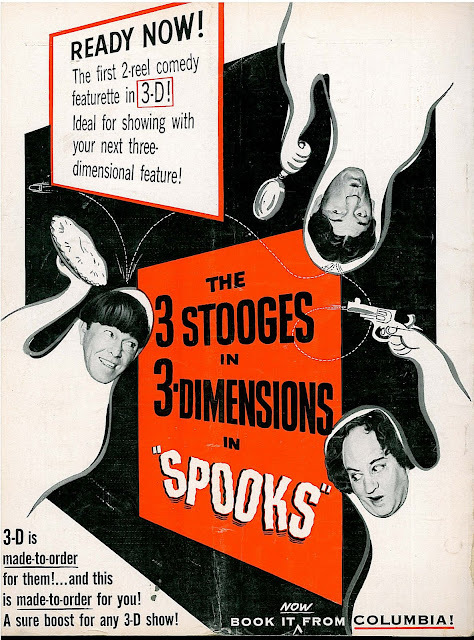 Still, the Three Stooges in first-time 3D got fantastic rentals, with Spooks earning $93,000 domestic from stereo bookings, along with $27,000 from 2D engagements. The team’s average take from the previous 1951-52 season of eight shorts had been $37,350. I have yet to see any of these in actual 3d! Hopefully the advent of 3d tv's and blu-ray players in the next couple of years will finally make this possible. I have had the advantage of seeing the Stooges 3-D stuff in good, two projector, polarized 3-D several times. The 3-D wasn't all that good. It does sound as if the writer is part of that 20% of the population that cannot see stereovision. Pity … it can be a fun gimmick. I heard that a lot of the Stooges ghosts and monster and old dark house comedies were released on DVD. Now that's my kinda DVD! Is that true? What is the disk's exact name? I remember seeing those Stooges 3D shorts on many Saturday mornings. It seemed like there was little in the way of script or direction other than, "Larry points cane at camera." They made absolutely no sense in 2D but I instinctively knew they were meant to be watched with cardboard glasses. I think I'm more the norm with the Stooges. LOVED them as a kid, now enjoy them only from time to time but that's mainly nostalgia I think, unlike Laurel and Hardy or Fields, whom I still LOVE. I just saw Spooks in a not so great 3D film print at a showing in Glendale, CA. (It was too dark) It would be fun to see a good print, even on TV. You just reminded me I had never seen SPOOKS before so I headed over to YouTube where, of course, I found it. It's obvious it was planned all along to be released with FORT TI as Moe says early in the film, "We'll be there before you can say 'Fort Ticondaroga!'" Columbia Pictures' 8mm division released SPOOKS in 3-D back in the day. I bought the silent, 50-ft edition, which of course came with cardboard glasses. I still have it. The effects were reasonable enough, but I don't think I could have tolerated more than 4 minutes without getting one of those "Cody Jarett headaches" you mentioned. Unfortunately, Sony/Columbia botched the DVD presentation of the Stooges in 3D. The 3D glasses, and the films themselves, are split into green and red, rather than the more traditional (and better) cyan and red. The colors should be such that the left filter blocks what your right eye sees, and vice-versa, and red blocks out cyan much more thoroughly than it does green. The result on the DVD is a double image -- talk about headaches! -- for both "Spooks" and "Backfire." And it would have been just as easy to do it properly. Sigh. John, I wouldn't say that all women hate the Stooges. My wife likes the Stooges, and my mother never forbade us kids from watching them on TV (in the late 1950's) like a lot of moms did at the time. I still enjoy the Stooges, and look forward to watching them on AMC this New Year's Eve. I also appreciate Shemp more, as I get older. I'm glad to see his best work get the same attention and care as the Curly shorts did. I saw SPOOKS! in two-projector, polarized 3-D theatrically (with DIAL M FOR MURDER, if memory serves), and the first minute or so had flickery, intermittent stereoscopic effect. I found out why when I was invited into the booth afterward. One of the projectionists showed me the SPOOKS! print on the rewinds and said, "I had to slug the hell out of the left print!" Columbia had evidently sent an original-release print from 1953 that sustained some damage early in the first reel, and the projectionist had to insert black frames to keep it synchronized with the "right" print. I still think SPOOKS! is the champion for killer 3-D effects. It isn't enough to just throw something at the camera: director Jules White sets it up first! Mad doctor Philip Van Zandt, gleefully brandishing a hypodermic needle in a look-what's-coming shot, sent the house into a delighted uproar, and when Van Zandt aimed the needle right into everyone's faces, the crowd broke into a giddy scream. The 16mm rental print, using the red-green anaglyphic process on a single piece of film, wasn't a patch on the 35mm presentation. 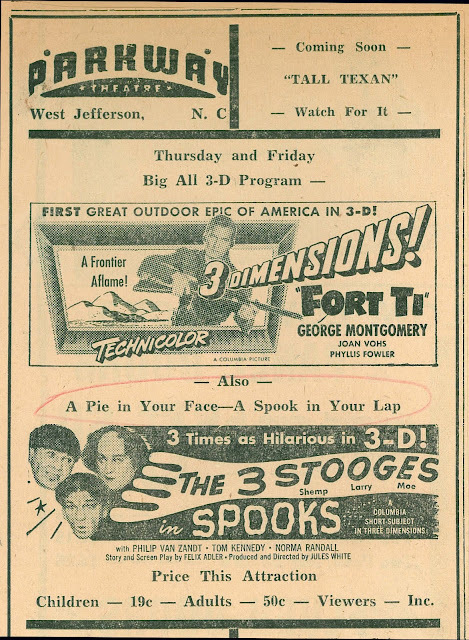 A few years back, the New York City's Film Forum in New York had a month of Thursdays devoted to Columbia's 3D output and I made the drive in from PA to catch whatever was showing- which was one of the two Stooges shorts in front of the main feature each time. (MAD MAGICIAN was one of the two features I caught. I can't remember what the other one was....) Ironic, as I'm not much of a Stooge fan. The prints were, IIRC, advertised as being newly struck from the original negatives and were beautiful. I remember the entire audience jumping and then alughing at themselves in PARDON MY BACKFIRE when oil was sprayed right at the camera! I saw this during a 3d festival back in the 80's. It was playing with Dial M For Murder. Hitchcock's use of 3d was barely noticable except for the shot we've all seen where Grace Kelly reaches back and grabs a pair of scissors. The Stooges' use of 3d was a little less subtle. I remember Moe's two-fingered eye-poke, the hypodermic needle and pretty much every object you can think of flying at the camera. It was hilarious. I've really enjoyed all these comments about the Stooges in 3D, and feel a little deprived for not having seen "Spooks!" in one of those revival showings everyone else seems to have caught! I got one used, and it's only collectible for the box art now! The color stock has completely gone south. Thanks to the fading, there is no longer any red/green differentiation and thus no 3-D function. My noggin's still smartin' from Warhol's Frankenstein. That scene where the drippin' guts of some poor unfortunate are streaming towards me in 3-D still gives me disgusted shivers. I'm hopeful that a standard for 3d content on Blu-Ray will open up the doors for many of the 1950s and 80s 3d efforts from the studios. Some are remarkably effective in their original format. Interesting to see an ad from the Parkway in West Jefferson hawking their 3d showings - it's in my home town and I regret I was born ten years too early. I did catch some of the 80s 3d films (Jaws 3D, Comin' At Ya, etc) at the Parkway. The theater had become a duplex with a platter system by them, so we saw them in "over-under" format with that big mirrored lens attachment on the front of the projector.